VALA invites you to our final Guest speaker event for 2017, and SGM. Join us at the Library at the Dock on Wednesday 22nd November from 5:30pm. Join VALA and special guest speaker, Kathy Reid, for a thought-provoking and surprising conversation about the role that women, librarians and technologists play (or should play) in ensuring freedom of data and information. With reference to the book burnings of the great dystopian novel Fahrenheit 451, and more recent speculative writings of cyberpunk authors William Gibson and Neal Stephenson, Kathy will explore the touchpoints between librarianship and IT and democratic access to information against a backdrop of issues such as surveillance, data collection and artificial intelligence. For several centuries, women have been portrayed in different roles and archetypes in science fiction. They include the protector, the agitator, the guardian and the agent provocateur. As science fiction increasingly becomes science fact, we need to critically evaluate whether the science fiction depiction of women is becoming fact also. This presentation will challenge the audience to think differently about not only gendered roles in information technology but the roles all of us play against a backdrop of issues such as censorship, surveillance, big data, artificial intelligence and governments that struggle to understand all of these. The Future: As technology increases to the point where the lines between humanity on artificial intelligence blur, we need to critically think not just about how we approach the custodianship of technology but how we approach the custodianship of humanity itself. Who Should Attend? : Anyone interested in the relationship of what it means to be human and a woman in the year 2050. Q&A: Kathy will respond to questions at the end of the presentation. Kathy has a 20-year career in information technology, covering areas such as web development, digital design, video conferencing and digital signage. 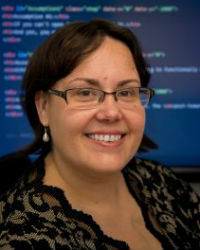 She is currently President of Linux Australia, and is a strong advocate of open source software and systems. She holds degrees in Arts and Science, and an MBA. Kathy’s presentation will be preceded by our end-of-year drinks, and follow the (very brief) business of the Special General Meeting, as advised to VALA members. Complimentary ‘End-of-Year’ drinks and nibbles on arrival. For any enquiries contact VALA Secretariat via vala@vala.org.au or (03) 9844 2933.